The family of HARA claims descent from Cormac Galleng, grandson of Kean, third son of OILIL OLUM, King of Munster in the 3rd century. Beice, fourteenth in descent from Cormac, had a son, Eadhra (Eara), Lord of Leyny, County Sligo, whose son Magnus assumed the surname of O'HARA, and died in 926. Hugh O'Hara, seventh in descent from Magnus, had three sons: Dermott, from whom the family of O'Hara Boy; and Arthur, from whom the O'Hara Reagh, both in County Sligo; and Cuconnaght, from whom O'Hara of The Route, County Antrim. CATHAL, or CHARLES O'HARA, of The Route, was the seventh in descent from Cuconnaght O'Hara. Cathal (or Charles) O'Hara was seized in the reign of JAMES I, of the territories of Loughguile and Leganlie in The Route and Crebilly, and obtained a grant from the Crown, 1606, of Tuoghkearte [sic]. COLONEL HENRY O'HARA, of Crebilly, who wedded firstly, Lucinda, daughter of the Rt Rev Dr Francis Hutchinson, Lord Bishop of Down and Connor, and widow of Charles Hamilton, of Portglenone. She had by her first marriage one son, Charles Hamilton. JOHN HAMILTON, who assumed the name of O'HARA, and espoused firstly, a daughter of the Rt Hon Richard Jackson, by Anne his wife, only daughter of Charles O'Neill, of Shane's Castle, who died without issue. HENRY HUTCHINSON HAMILTON-O'HARA JP (1820-75), his heir, of Crebilly and Marlagh Lodge, who married, in 1841, Alicia Isabella, daughter of General the Hon Sir Henry King KCB. 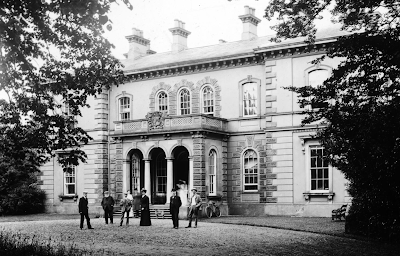 Mr Hamilton-O'Hara dsp 1875, and his sister (Mary Jane Wardlow) was, in 1885, in possession of Crebilly estate. CREBILLY HOUSE, near Broughshane, County Antrim, was a two-storey, 19th century, Italianate house which was possibly the work of Sir Charles Lanyon. It had a seven-bay front, with four end bays breaking forward. The windows were cambered, round-headed and rectangular. The porch was in the form of a three-arched loggia, with Tuscan columns, surmounted by a pierced parapet with armorial bearings in the centre. There was rock-faced rustication on the side piers of the porch. It is believed that Crebilly House was burnt in the 1920s and the ruins later demolished. 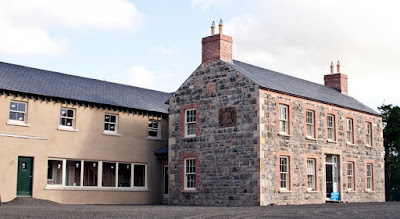 The estate is now owned by the O'Kane family, who have built a new house (above) on the site of the mansion. 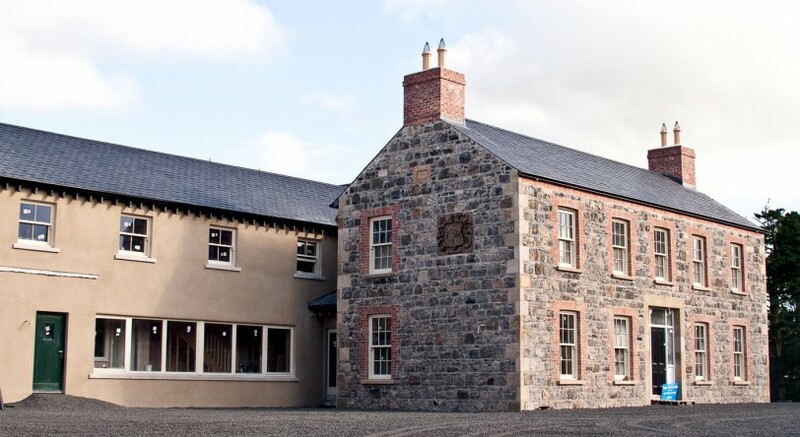 It is thought that the present dwelling includes the original Victorian cellars, and certainly uses some of the original stonework, including the O'Hara crest, which was above the front door of the original house. 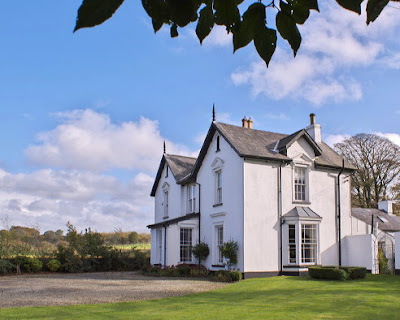 MARLAGH LODGE, near Ballymena, County Antrim, is a country house of ca 1850 in a slightly eclectic, Victorian mixture of Picturesque and late Georgian elements, with gabled bays, render, roof overhang and finials, neo-classical window surrounds and half dormers. To its front is a square porch with a lean-to roof, which was probably originally flat. At the rear is a long, single-storey return which may originally have contained rooms for a servant, but which was a separate dwelling for much of the 1900s. Marlagh was occupied ca 1859 by Henry Hutchinson Hamilton-O’Hara, who presumably built the property, probably around 1850 or slightly later. He died in 1875 (seemingly in impecunious circumstances in London) and Marlagh Lodge passed to his only sister, Mary Jane, the wife of Colonel Robert Wardlaw. The Wardlaws appear to have leased the property firstly to a Robert Craig; then (by 1884) a Robert Esler. About 1901 Mr Esler acquired the freehold of the property and leased it to a John Dinsmore; and then (from 1908) to Dr Alexander Duncan. Subsequently, the single-storey return (which probably originally contained quarters for a servant or servants and service rooms) had become a separate dwelling rented out by the owner of the main house. In 1920 the house and the rear dwelling were sold to Thomas McAllister; passing to John McFetridge in 1926. They remained in the possession of McFetridge’s relations until acquired by the present owner in the 1990s. First published in December, 2016. Very merry Christmas, Old Man of the West.